Itha Elmer DOYLE had two paternal half-brothers whom he had never seen. Mary Louise PAYNE had two paternal first-cousins whom she had never seen. Elmer's unknown half-brothers were Mary's unknown first-cousins. Likely Elmer's mother (Lucy) had been the midwife for Mary's mother (Elizabeth) when some of Elizabeth's children were born. Mary's mother knew Elmer's mother when Elmer was born, and Mary's mother would have known Elmer when he was about eight and lost his mother to death in late February 1883, just three months before Mary was born. The two mothers almost certainly were friends. Friendship usually leaves no records, but family history says that Elmer's mother was buried in a plot donated by Mary's parents. It's also likely that their fathers had been friends: Itha's father (Tom) had been the brother-in-law of Mary's father (William) when Tom was married to William's sister Permelia. Mary's father died when she was five; her mother remarried less than a year later. Like Mary's father, Mary's stepfather also would have been a friend of Itha's father, because the stepfather was William's brother brother Able Wade. 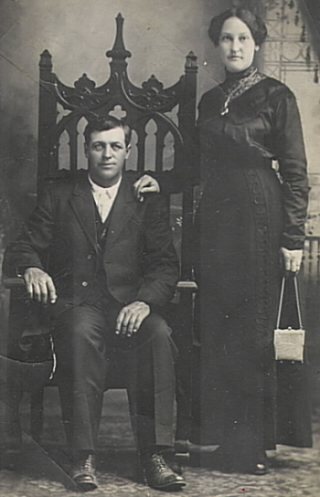 Itha and Mary married December 19, 1900, in Danville, Vermilion County, Illinois. Mary was 17-and-a-half; Elmer was nine years her senior.They did not know what they would have to face together: The farmer's depression in the early 1920s. The Great Depression in the 1930s. Absolute poverty. Before their fifth child was born in 1921, they moved from Vermilion County to Minnesota to raise potatoes, because potatoes were selling at a high price. When they moved, they had two train cars filled with their possessions -- one filled with household goods, the other with farm animals. When they left Minnesota a few short years later, it was with little more than the clothes on their backs and debts owed beyond what they could ever repay. Because the price of potatoes had risen so high, too many farmers were growing potatoes. When Itha tried to sell his crop, he could not have given the potatoes away; the market was flooded. At the age of 47, Itha had lost everything. He spent the rest of his years working someone else's land. He and Mary never again owned their own farm. They took their family back to Vermilion County and they were poor the rest of their lives. By April 2, 1930, Elmer and Mary were living in Lincoln Township, Berrien County, Michigan. According the the U.S. Census, Elmer was working as a manager on a farm. Living with him and Mary were their youngest two children: a 12-year-old son and a 9-year-old daughter. Nearby households included Elmer and Mary's daughter Hettie (21), with her husband Vernon (26) and their two-year-old daughter, and Elmer and Mary's son Lester W. (26), with his wife Hazel E. (38), and their two daughters who were three-years-old and one-year-old. Before 1940, Elmer moved his family back to Vermilion County, Illinois, and before 1950, Elmer and Mary moved back to Berrien County, Michigan, where Mary died in 1953 and Elmer died in 1958. For burial, their bodies were taken back to Vermilion County, Illinois. Their remains were interred at the Potomac Cemetery in Potomac, Illinois. Elmer's exact birth date is not known. He had a twin sister, Ida Ellen; neither remembered their birthday. He was illiterate. He described himself as having gotten to the second grade when his mother died in February of 1883; that would mean that he was about eight years old when he became motherless. After Elmer's mother died, he did not go to school. There was no organized child care in rural Illinois in the 1880s; his father placed the children with various families and would see Elmer on the weekends. His dad also was illiterate, worked as a miner, and would not have be able to care for children during the day. Even as an old man, Elmer blamed his father for his mother's death. His mother had died of a strangulated hernia, and Elmer said his father should have found a way to pay for surgery to repair the hernia, so that it would not have become strangulated. What Elmer never realized was that such surgeries were not done until after his mother's 1883 death. Itha Elmer and Mary Louise were husband and wife for fifty-two years and eight months, until parted by Mary's death. After Mary died, Itha Elmer wore her wedding band on his little finger. 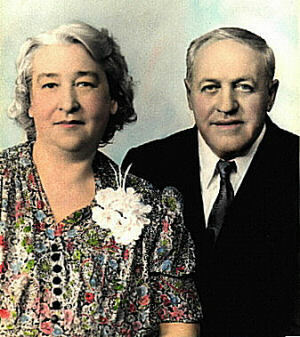 The picture at left shows Itha Elmer and Mary Louise as an older couple. Through Itha or Mary, their children and grandchildren descend from -- among others -- two Civil War veterans, three D.A.R. established patriots of the Revolutionary War, a Captain in the French & Indian War, a woman executed as a witch because she believed she saw her dead child, one of the 25 elected barons who held title to some of King John's property so as to guarantee compliance with the Magna Charta, Eleanor of Aquitaine, Scotland's William the Lion, Scotland's King David I, Malcolm III, and Duncan who was murdered by Macbeth. CENSUS: 1920, Norman Co., MN; 1910, Grant Twp., Vermilion Co. IL; 1900, Butler Twp., Vermilion Co., IL. CLICK to see marriage #1 divorce decree and marriage #2 records.
. . . . . CLICK for divorce decree for marriage #1.
. . . . . CLICK for marriage records for marriage #2. 12 granddaughters and 10 grandsons. The attempt here is to present accurate genealogical information that meets the standards of genealogists. Errors have been corrected as they have been found, and additional information has been added as it has been learned.